Left Coasters The Waybacks brought their high-spirited rootsy sound to the Narrows on Sunday night, accompanied by rain and lightning. And was that thunder, or their drummer? Our friends at MVY Radio streamed it live on their website mvyradio.com. If you heard the show on the Internet, let us know! Please leave a comment. A packed house at the Narrows Friday night were treated to the blues stylings of Ronnie Earl and the Broadcasters. Ronnie, in the photo above, looked almost scholarly as he played the electric guitar to standing ovations almost from riff number one. Your humble blogger noticed something about Ronnie's playing that he hadn't noticed before: While he's a blues player, his choices within the blues are usually non-traditional, uniquely his own. Any other thoughts about Ronnie's choices on the guitar? The Narrows Sunday night show starring the Waybacks will be streamed live at mvyradio.com. They recently streamed the Walter Trout show live, and the quality was fab. The stream will start when the show starts...about 8:10 to 8:15 usually. This is a groundbreaking collaboration between the Narrows and WMVY radio, out there on Martha's Vineyard. Thanks to the support of our audiences and donors, the nice folks at WMVY, and the Narrows' leadership and volunteers (most importantly Prez Patrick Norton and manager Deb Charlebois), the Narrows continues to break new ground to increase accessibility to the arts. With blues cats Watermelon Slim and the Workers making their Narrows debut in a few weeks, your humble blogger presumed you may wish to browse a review of their latest disc. While the Narrows has been having a lighter schedule in July, the Narrows crew has been creeping to other music events, trying to satisfy our sometimes insatiable musical appetite. For example, your very humble blogger went and saw Billy Joel. Yes, yes we realize that many of us hipsters don't fully embrace the Piano Man. Nonetheless, it was a great show. So there. Narrows Prez Patrick Norton headed west to the Green River Festival in Greenfield, MA, which featured several Narrows alums, including Mavis Staples and Crooked Still. Above is a photo of the vivacious Mrs. Norton at the festival with Brad Madison of Mongrel Music, which books many of the Narrows' musical artists. Shelby Lynne is coming to the Narrows in November. Soon to be on the official schedule. Thursday night at the Narrows was radical. First, electric blues madman Walter Trout and his group the Radicals pushed the pedal to the metal, playing fast and loud, kicking the blues to the extreme. Trout's fingers were some of the fleetest ever to digitize a fretboard on our stage. And the bass, drums and organ drove him even further. BTW--his cover of Hound Dog Taylor's "Give Me Back My Whig" was one of your humble blogger's favorites. Another BTW--Trout is a better-than-average-singer too. Second, the concert streamed LIVE on mvyradio.com. Another first, and the beginning of more live streams courtesy of WMVY (based in Martha's Vineyard) from the Narrows. Your humble blogger and other Narrows' volunteers listened to some of the show on-line in the Narrows' office. Cool. Keep an eye out for more on-line action very soon. Banjo player Abigail Washburn, who performs with Uncle Earl, is written up in the latest issue of Newsweek. 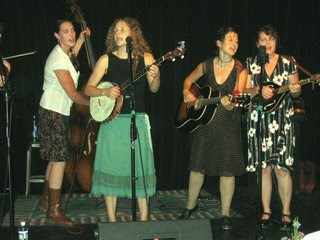 Abigail, in the photo (with the banjo) in 2006 performing at the Narrows as a member of Uncle Earl, is profiled due to the release of a CD with her group the Sparrow Quartet and her interest in China. Your humble blogger should have posted this awhile ago. The nice folks who run the Narrows weekly open mic have a myspace page featuring recordings of the performers. Chuck Prophet left a comment on a blog entry about his show Thursday night. I think that's the first time an artist has checked in. Thanks Chuck for taking the time! Great show. Don't know if it's a secret or not but an upcoming Narrows concert will be streamed live on the Internet via our good friends at WMVY. Another first. The Infamous Stringdusters are coming to the Narrows in late October. Read a review of their new CD here. Some new plumbing has arrived at the Narrows. First the new sound system, the elevator, the ceiling fans, then this. Congrats Narrows prez Patrick Norton and manager Deb Charlebois. Did you know Narrows alum John Sebastian played harmonica for The Doors? The radio station for folkalley.com is pretty darn good. No Depression magazine died, as you may know. I'm supposed to get some issues of Paste Magazine as a replacement, courtesy of No Depression. Finally read a hard copy of Paste the other day (although I'm still waiting for it to come in the mail). Pretty good. One of my swimming friends worked at Woodstock (the original event) helping flipped out concert goers make safe landings. He went to the concert as a fan (he says he still has his ticket), but was recruited because he was studying social work stuff in college. He makes a living these days selling balloons and such at parades and he's an expert on the history of the Alamo. What a long strange trip! Currently reading the book Hip Hop Matters: Politics, Pop Culture and the Struggle for the Soul of the Movement, by S. Craig Watkins. I know, I know. You think because your humble blogger emcees at the Narrows that he only likes folk music, jazz, jam band and all the politically correct stuff. Not rap or metal. Well, you'd be wrong. Keep an open mind and set of ears. Remember: the kids are alright. It may be a bit of trivia, only of interest for long-time Narrows fans and volunteers: Thursday night marked the return of the Jim James Band. Well, not exactly. The opener for Chuck Prophet was Brad Huff, who played guitar for that band and seemed to be its leader (there was nobody named Jim James in the group). They played the Narrows a time or two or three way back in the beginning, probably opening for somebody or another. Then they were gone. Too bad, because your humble blogger thought they had a lot of promise. Welcome back Brad. This old time Narrows guy remembers. Alt-rocker Chuck Prophet and his band brought their San Francisco groove to the Narrows Thursday night--kind of a Tom Petty meets The Beatles meets roller rink organ. Very cool. Your humble blogger chatted with Chuck before the show regarding Chuck's dad being in the breakthrough rock 'n' roll film Blackboard Jungle in 1955. Chuck says his dad was an extra in several classroom scenes--sitting next to actor Vic Morrow (remember Sgt. Saunders in the TV show Combat!?). His dad was a student at USC at the time. Chuck attracted an enthusiastic crowd, larger than when he last played the Narrows about 4 years ago. We're delighted to see the growth in his fan base here on the East Coast, and hope to have him back soon. Chuck was backed by his wife on keys and harmony vocals, as well as a drummer, bassist and guitarist. Chuck, himself, played some mean lead guitar, by the way. As reported earlier, Richard Shindell had an untimely accident with an axe, affecting one of his fingers. Although the initial word was he was going to tour anyway, a reader has posted that his appearance at Summerfest in New Bedford was cancelled. And now his website is canceling more shows and providing more details on the accident. This coming week's Narrows show with Chuck Prophet is a pick for the editors at The Providence Phoenix. Your humble blogger mentions this because Chuck Prophet is not exactly a household name in these parts, even though his last show at the Narrows a few years back was fab. Check out the Phoenix write up here. We hate to do this to any son of a famous performer, but, heck, you'd figure it out anyhow. So here goes: Steve Earle's son is coming to the Narrows. His name is Justin Townes Earle (yep, Townes is for Mr. Van Z), and he's coming September 25. It should be posted very soon. Give a listen to this young man by clicking here. For those of you who follow the health issues of those who perform at the Narrows, here's a tidbit about Richard Shindell: Over the weekend his left index finger got hurt by an axe (no other details). The finger is out of action for a couple months, but he will continue to tour despite it. He claims it's the second stupidest thing he's ever done. "Never mind about the first."